The 2019 Toyota Highlander is a three-row crossover known for its passenger comfort, cargo space that’s beyond impressive, family safety, a strong V-6 and an impressive hybrid edition. The styling was tweaked with more sharp angles last year, and the interior was improved, so the changes for 2019 are all cosmetic. The SE gets dark-tinted headlights, taillights, foglights and wheels, while other models get black plastic rocker panels and some new contrasting chrome. The base engine is a 2.7-liter 4-cylinder that makes 185 horsepower, with front-wheel drive only. The engine that’s far more common is a 3.5-liter V-6 making 295 horsepower, mated to a smooth 8-speed automatic transmission, with all-wheel drive. The V-6 Hybrid makes 306 horsepower with the help of its electric motors, and is one of the most fuel-efficient larger crossovers. The ride is soft and luxurious, and the handling is good especially considering it can seat up to eight people in comfort. The blocky styling might suggest more rugged use, and with all-wheel drive it’s certainly capable of snow and mud, but for off-road use the Toyota 4Runner makes more sense. An all-wheel-drive Highlander with the V-6 engine is EPA-rated at 20 mpg city, 26 highway, 22 combined, which is about average for a family crossover. The base 4-cylinder engine gets no better, in fact a bit lower on the highway. A V-6 with all-wheel drive costs about $3,500 more. The Hybrid gets a solid 30/28/29 mpg in LE trim with 18-inch wheels, and 29/27/28 mpg for the XLE, Limited, and Platinum with bigger wheels and a roof rack that increases drag. It’s only available with all-wheel drive. The Highlander earned five stars overall from the NHTSA for crash safety in 2018, with four stars in frontal crash and rollover. The IIHS named it a Top Safety Pick+. The Highlander leads its rivals in standard active safety equipment, including forward-collision warnings, full-speed automatic emergency braking with pedestrian detection, adaptive cruise control, active lane control, and automatic high-beam headlights. The 2019 Highlander is available in LE, LE Plus, SE, XLE, Limited, and Platinum models, many of which also come as a Hybrid. Prices span from about $32,000 for a 4-cylinder front-wheel-drive LE to more than $50,000 for a Lexus-like Highlander Platinum Hybrid. Even the LE is well equipped, but surprisingly Apple CarPlay and Android Auto functionality are not available on any model. The LE comes with either engine. It doesn’t look like a base model with standard 18-inch alloy wheels, tinted windows, and turn-signal mirrors. The interior gets cloth upholstery, a 4.2-inch LCD screen in the gauge cluster, a rearview camera, power driver’s seat, and a 6.1-inch touchscreen for infotainment with Bluetooth. The LE Plus adds about $2,400 to the price and includes an 8.0-inch touchscreen, smartphone-driven navigation, three-zone automatic climate control, a power passenger’s seat, synthetic leather and cloth upholstery, a flip-up rear window, and more. The XLE adds a moonroof, GPS navigation, real leather, heated front seats, and the capability for the driver’s voice to come through the third-row speakers. Highlander SEs have a firmer suspension and sportier appearance, all that black trim, plus black leather upholstery. The Limited trim adds cooled front seats, a heated second-row seat, and a JBL audio system, while the Platinum adds a surround-view camera system, a heated steering wheel, and a panoramic moonroof. The all-wheel-drive-only Hybrid is similarly equipped and comes in every model but the LE and SE. Overall, the 2019 Toyota Highlander is well-proportioned and muscular. The grille looks like a five-blade shaving razor. It’s a long wagon-like vehicle that makes no bones about being a minivan substitute—but it doesn’t go all-in with sliding side doors. The SE doubles down with all that black trim. It’s not a performance model—it just likes the sporty clothes. The Highlander cabin is comfortable and well designed, resulting in convenience, functionality and good looks. The wide two-tiered dashboard is laid out logically, with pass-throughs for USB chargers to keep it clean. There’s an abundance of small storage spots, in addition to the shelf that’s integrated into the dash. The quality of the materials is high, and the trims are mostly attractive. Some wear silver plastic trim, others a woodgrain. The infotainment system is easy to use but it can be slow, and unfortunately Apple CarPlay and Android Auto aren’t available. The Highlander’s forte is carrying people. The front seats are soft and supportive, with power adjustment on the driver’s side; the XLE and above get power for the passenger as well. The second-row seats slide fore and aft, allowing for ample legroom. Two captain’s chairs are available to replace the three-person bench, which improve access to the third row. That rearmost seat is livable for small adults, but best for kids as all of them are. It folds with the pull of a lever, creating a flat but somewhat high cargo floor. The 2019 Highlander’s cargo space is beyond impressive. There’s a trunk-sized 14 cubic feet of cargo space behind the third row; an extremely useful 42 cubic feet with the third row folded; and with the second row folded, you can fit 83 cubic feet of stuff in there. The 2.7-liter 4-cylinder is standard on the front-wheel-drive LE, and makes just 185 horsepower and 184 pound-feet of torque. That’s not enough to pull a two-ton crossover without straining much of the time. Fortunately the LE can come with the V-6 and all-wheel drive. The 3.5-liter V-6 makes an ample 295 horsepower and 263 pound-feet of torque, and is mated to a smooth 8-speed automatic transmission. It’s the pick of most Highlander buyers and it’s recommended, but there’s one more option. The Highlander Hybrid is available in LE, XLE, Limited, and Platinum trims, and uses a version of the V-6 engine mated to a battery pack and two electric motors that power the rear wheels, making every hybrid all-wheel drive. It makes a combined 306 horsepower, but isn’t faster than the standard V-6 because it has 300 more pounds to carry. It responds to smooth driving. Its continuously variable transmission isn’t as smooth as the 8-speed automatic and it drones under hard acceleration, but fuel economy gains may be well worth it. The Highlander’s steering is precise and light. The suspension is tuned for a comfortable ride, not nimble handling; if it’s too much that way (and if you like black) there is the SE model, which has a firmer ride and corners better, although it’s still hardly a canyon carver. The LE and XLE models ride a bit better thanks to 18-inch wheels with plenty of sidewall to cushion sharp impacts. The Limited and Platinum have 19-inch wheels that are noticeably firmer. A fairly high 8.0 inches of ground clearance makes modest off-roading possible, but the 2019 Highlander is not equipped for anything beyond the occasional rough dirt road. 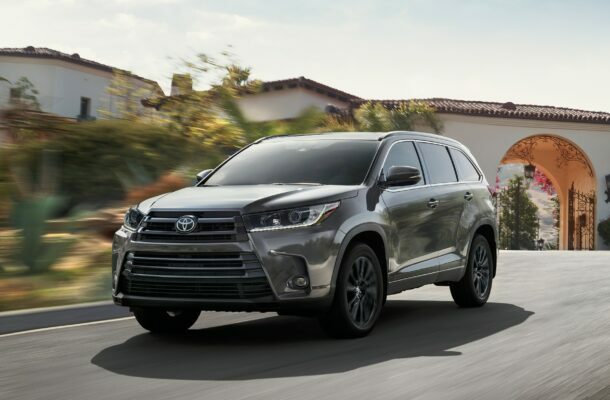 The 2019 Toyota Highlander offers all the bona fides families want in a three-row crossover SUV. The V-6 with 8-speed automatic and all-wheel drive is a great powertrain. It’s very safe. The ride is nice and the handling is consistent with the mission, carrying eight people in comfort. The mission was not to double as a minivan, but with the vast interior capacity, it can do just that.